I went to see this film last night expecting to be happily entertained for a couple of hours. Instead I left deflated and fighting a “pissed off” feeling. Among the hundreds of human survivors in post-apocalyptic San Francisco and the large group of apes in the forests, the cast consisted of just two female characters, one ape, one human. The human woman, Ellie, was played by Keri Russell. Some may know her from The Americans. I remember her from her days on Malibu Shores. The female ape – As far as I know she wasn’t addressed by name. She was Caesar’s wife, gave birth to his son, got sick and that was the extent of her character. The gang of human survivors: I noticed a couple of female faces in the crowd but they were nameless and voiceless. The group of humans who venture into the apes’ territory? All male except for Russell who has very little to do. In fact she’s left entirely out of the final battle scene. How about the females in ape society? Apart from Caesar’s wife, I didn’t see any. The only reference to females was Koba saying females and young were to stay put while the rest of his army went out to fight. That was about the moment I half choked on my fizzy cola bottle sweet. Seriously. Just seriously. I’ve seen mostly four star reviews in the local newspapers as well as online. Did the critics notice the glaringly obvious lack of female characters, or are they just ignoring it? How about the writers and directors? My gut tells me no one set out to intentionally create a film almost devoid of a female voice, but that’s what has happened. As I’m writing this, I’m starting to get angrier than I was watching this film. This new “Dawn” is one where women are not welcome. Have you seen Dawn of the Planet of the Apes? This entry was posted in Film Reviews and tagged dawn of the planet of the apes lack of female characters, dawn of the planet of the apes no women allowed, sexism in Hollywood 2014, where are all the female characters in movies. Bookmark the permalink. This has been on my list to see, but I’ll probably wait until it hits DVR. I remember watching the original Planet of the Apes movies way back when, and I’m pretty sure there was a female among the apes who had a dominate role. Maybe I’m wrong. I don’t remember any female humans though. I guess some movies are just testosterone-driven. Weird that the oversight hasn’t been noted by critics. They’re usually pretty quick to pick up on omissions like that. It was probably forty minutes or so before I started to pay attention to the lack of women. I watch lots of “boys” movies and enjoy them, but this time it was so obvious I was flabbergasted that cast, writers, producers etc didn’t notice. I do think it was a good film. 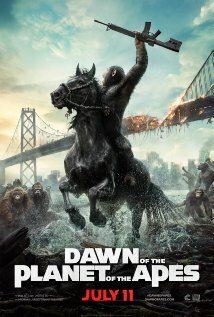 I liked the father, the family relationship and the apes were impressive looking. Just a shame about the portrayal or lack thereof of women. It was just weird. Think of any post-apocalyptic TV shows and movies today and while the main character may not be a woman, there are plenty of women around, but not in Dawn. Keri Russell is known these days for portraying strong, capable women. I wonder if she was disappointed by her character in Dawn. Ugh, what a disappointment! I’m not surprised you’re feeling ranty, I would be too if I’d paid to see that film. I watched the first one and while I thought it was alright, I wasn’t that bothered. Well, I definitely won’t be bothering with the second one now! I have never gotten into those movies. Granted, I am more of a TV addict, than “movies”, but when I see the promos it looks even more ridiculous than the B movies I love. I just can’t go there. LOL And about the women thing, hmmmm. It actually isn’t ridiculous. 🙂 The CGI was great, post-apocalyptic San Francisco was very well done, and I felt more empathy for the ape, Caesar, than I did the humans. My only gripe was – well you know what it was at this stage. Thanks for reading and leaving a comment, Sherry. I haven’t seen it but a guy I know said it was terrible. So disappointing. Damn, that’s surprising. It sounds like Lord of the Rings all over again, only without being based on a widely-loved book (and without Eowyn 🙂 ). This is a factor to me in which movies I choose, that’s for sure. Guess I’ll have to wait for the next Resident Evil movie for my post-apocalyptic movie fix. (In the last one in the series, the top five actors in the crawl at the end were all women, and the main problem with the movie was that the men were not interesting enough). Anthony, don’t not go see this based on my rant. It’s an entertaining film. You are probably one of the few guys who bases a decision on what movies to watch on if women are featured/portrayed well. So well done! You know I really loved Lord of the Rings. I suppose I’m more accepting of the almost all boys cast because the books were written some time ago and set in a different sort of era. Well, it wasn’t really at the top of my list anyway. I’m more waiting for Guardians of the Galaxy (and now I’m getting introigued by Lucy — any movie that’s compared to The Fifth Element gets my attention 🙂 ). I really liked the Lord of the Rings movies. For one thing, as I say, I knew going in what they were going to be like (I’ve read the books several times) and they were really well done. On the other hand the Planet of the Apes movie is based on a movie (the original one) where a female character was very important (a scientist, played by Kim Hunter). Also, and most importantly, Lord of the Rings has Eowyn. She’s not one of the biggest characters, but she’s awesome. Carmel, go see it and enjoy it. The story was good and so were the apes! Hopefully my rant won’t have ruined it for you. Honestly I didn’t even notice, but I rarely do. I was just watching Die Hard 2 with family and they all pointed out several plot holes that I never noticed. Apperently I’m too content to just be entertained. But I just watched Gravity and I thought that movie was fantastic. Such pristine cinematography and a strong–eventually–female lead. Sandra Bullock was cramazing. Shame that you spent the money to see a movie that pissed you off. I hope Guardians of the Galaxy is everything I’m expecting it to be. Lol. I’m sure most guys won’t notice. I’m usually content just to be entertained too and leave my brain at the door. But this time it was just too obvious to ignore. Did you see Gravity in the cinema? Seeing it in 3D was probably the closest I will ever get to being in space. I actually ducked out of the way of debris a few times. And yes Sandra certainly was cramazing. I saw the trailer for Guardians of the Galaxy right before Dawn of the Planet of the Apes. It looks funny. I read Alex’s review of this, he said it was great. But you’ve raised some interesting objections. I’m still up for watching it, but I’ll stream it rather than pay cinema prices. 🙂 Have a great weekend. I’m sure many will think it’s great. It was a good film. I recognised that, but it struck a nerve with me.